Court proceedings for former Nassau County Executive Edward Mangano, his wife, Linda, and former Town of Oyster Bay Supervisor John Venditto kicked off Monday. This story was reported by Nicole Fuller, Andrew Smith, Robert E. Kessler and Emily Ngo. It was written by Ngo. 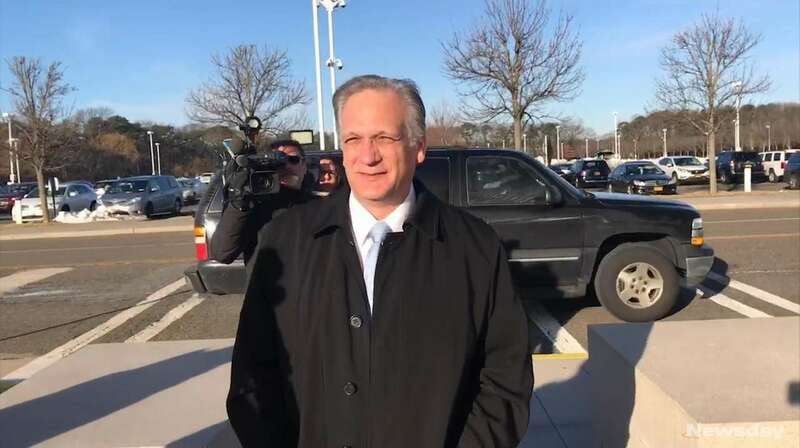 A federal judge seated a jury of six women and six men Monday in the federal corruption trial of former Nassau County Executive Edward Mangano and former Oyster Bay Town Supervisor John Venditto — as Mangano maintained he would be exonerated. Newsday reporter takes you inside corruption trial The corruption trial for former Nassau County Executive Edward Mangano, his wife, Linda, and former Oyster Bay Town Supervisor John Venditto began on Monday, March 12, 2018, with jury selection. 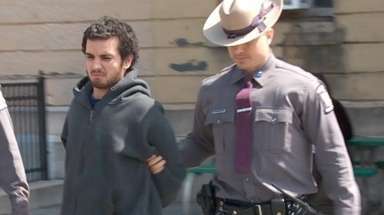 Newsday reporter Nicole Fuller reports on developments inside the courtroom. Inside the courthouse, U.S. District Judge Joan M. Azrack asked 51 potential jurors — one by one — about their jobs, what they do in their spare time, their favorite television shows and which public figures they admire. Six alternate jurors also were seated. Edward Mangano and John Venditto face charges that include conspiracy to commit federal program bribery and honest services fraud. Mangano additionally faces an extortion charge. Mangano’s wife Linda also is being tried and faces charges including obstruction of justice. Linda Mangano arrived separately from her husband. Venditto declined to comment to reporters. 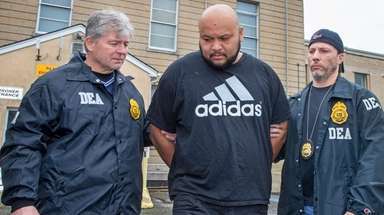 Former restaurateur Harendra Singh, a 25-year friend of the Manganos, pleaded guilty to bribing Edward Mangano and Venditto, and is cooperating with the government in its case against the officials. Singh provided Linda Mangano with a $450,000 no-show job at Edward Mangano’s request and footed the bill for the family’s travel to Caribbean vacation spots, among other bribes and kickbacks, Singh and prosecutors allege. In return, Singh secured lucrative county contracts and $20 million in indirect government loan guarantees from Oyster Bay, Singh and prosecutors say. Despite his Monday morning statement to reporters, Mangano appeared nervous before the prospective jurors arrived. He paced in and out of the courtroom. Also betraying their anxiety, prosecutors muttered about feeling stressed. The courthouse will be closed Tuesday for an impending storm, and opening statements are slated to begin on Wednesday. Singh, the leadoff witness, is expected to take the stand Thursday and be cross-examined next week. The trial is expected to last six to eight weeks. Among the prospective jurors, popular answers to Azrack’s question about the public figure they most admire were former president Barack Obama, former first lady Michelle Obama, former President Ronald Reagan and former talk show host Oprah Winfrey. “This makes me think she should run for president after today,” Azrack quipped after several potential jurors chose Winfrey. One person responded that President Donald Trump was who he admired most. Another named Ghana’s first Prime Minister Kwame Nkrumah and yet another answered New England Patriots quarterback Tom Brady. Prosecutors declined to comment after the jury was seated. “We’re extremely happy with the jury we’ve seated,” said Edward Mangano’s attorney, Kevin Keating of Garden City. Linda Mangano’s lawyer, John Carman of Garden City, also said he was satisfied. The defense attorneys have said their clients are the victims of Singh’s attempt at winning leniency in his own criminal case in exchanging for his cooperation. Singh also pleaded guilty to attempting to bribe New York City Mayor Bill de Blasio, who has not been charged. The case against the Manganos and Venditto is the latest to go to trial following federal investigations into influence-peddling by officials. The cases of former Suffolk County Police Chief James Burke, former Oyster Bay Town planning Commissioner Frederick Ippolito — who died in prison in June — and former Suffolk County Conservative Party leader Edward Walsh resulted in convictions and prison sentences. But elsewhere in New York State in recent years, public corruption trials have ended less well for federal prosecutors. In Albany, former state Senate Majority Leader Joseph Bruno’s case was overturned on appeal and he ultimately won acquittal. In Manhattan, former state Assembly Speaker Sheldon Silver had his conviction overturned, and a retrial has been scheduled for April. Also in Manhattan, a jury Monday said for the second time it was deadlocked in the case of Joseph Percoco, a former senior aide to Gov. Andrew M. Cuomo. Percoco is alleged to have taken $300,000 in bribes.